The back of many wine labels talk about ‘subtle oak influence’, or ‘integrated oak’. Wine reviewers and people discussing wine often refer to oak. What is oak and wine all about? Why should wines smell or taste like a particular type of wood? Why not other types of wood? Is it even desirable? These are the questions that were going through my head when I was first learning about wine. In time, I learned that the answer is historical, as is the case with many things. Oak barrels are the traditional storage vessels for wine. Oak forests were found commonly in Europe when wine was first becoming commoditised and shipped. ‘Oaky’ (!!!) 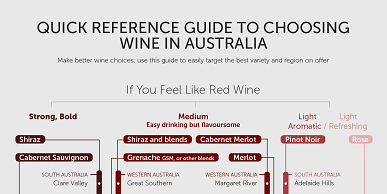 – This rather obvious one is the general ‘woody’ aroma that sometimes is prominent in Chardonnay, and particularly in a red wine that has been sitting in the glass for 5 or 10 minutes. It is OK to just say ‘oaky’ if you smell a wood-like aroma in your wine. ‘Coconut’ – Many red wines (especially Shiraz stored in American oak) can have a sweet coconut-like aroma. This is from particular flavours found in the oak after it gets toasted (during the making of the barrel) which are then absorbed into the wine during storage or fermentation in the barrel. ‘Burnt toffee’ – This aroma can be really prominent in Pinot Noir. Oak barrels are flame-toasted when they are made. Just like toffee (which is burnt sugar), some of the sugar-compounds in the oak are burnt and smell just like toffee. ‘Woody palate’ – Some full-bodied red wines can have a particularly ‘chewy’ or wood-like texture when in the mouth. 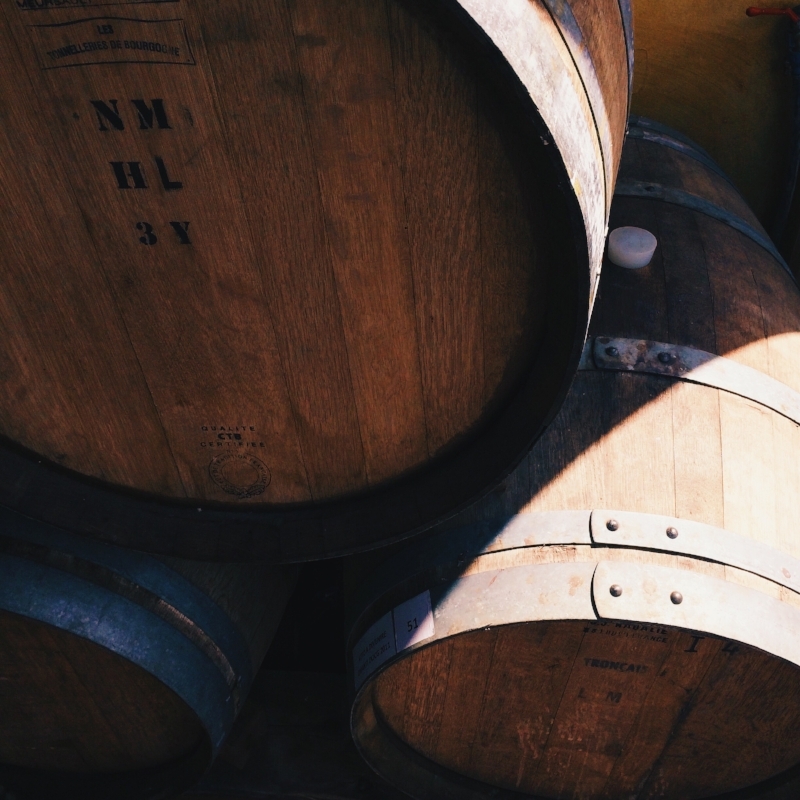 Wines stored in oak barrels can pick up tannins from the wood (as opposed to tannins from the grape skins), giving a particular texture and mouthfeel, sometimes associated with woody-flavours. ‘Toasty’ – This, also is from the toasting of the barrels. Chardonnay in particular can have a ‘toasty’ aroma from oak influence. Some toasty characters can also come from wines stored ‘on lees’ (with yeast in the bottom of the barrel after they have finished fermenting), like in Champagne or really good sparkling wine from Australia. As you might imagine, there is a whole world of subtlety, complexity and nuance in the wine industry about oak barrel selection and usage. Fear not! Oak does allow some evaporation of water (from the wine) through the wood itself. This can lead to a gradual increase in alcohol concentration if stored for a couple of years or more. In the case of sherry and port that can be stored for decades in hot environments, evaporation can concentrate the wines to make them more alcoholic, viscous, sweet and syrupy. Oak barrels do allow a tiny amount of oxygen through the wood and into the wine, which can add complexity and even texture to the wine, especially in white wines like Chardonnay which are more sensitive to oxygen than reds. Smaller barrels have more oak influence on the wine; It is a surface area-to-volume ratio thing. It can take up to 120 years of growth of a single oak tree before it is ready for harvest to make wine barrels. Major events like world wars, bushfires and major storms can devastate whole oak growing regions for generations. French oak grows more slowly that American and has rings that are closer together, which means more subtlety for the wine but more expense for the winemaker. Dealing with oak barrels adds quite a lot of expense to the making of wine; Most oak-influenced cheap wine (less than AU$10) will have been made in large stainless steel tanks infused with oak chips (in big mesh bags, not unlike tea bags!). So, there you have it – the essentials about oak and wine. Armed with this you can go forth with confidence: try some oak-influenced wines – taste, discuss and judge for yourself! Here’s an example of a Chardonnay with perfectly integrated oak for under $21.